A floor threshold is the material used as a surface junction in home and office interiors. The meeting of carpet and tile, or hardwood and carpet is often accented through the use of a stone strip. This not only makes foot traffic easier and safer, it also beautifies the interior of the premises. Marble is one of the most popular materials used as a threshold. Natural stone is prized for its beauty, functionality, and durability. Marble thresholds were once very expensive, but the direct import and distribution of natural marble stone has made it easier for contractors, builders, and flooring retailers to offer this product at an affordable price. Florida-based StonExchange is a leading importer of fine-quality natural stone products. We specialize in thresholds – often known as saddles – made from marble, granite, travertine and engineered stone. We also offer a full line of window sills, shower curb materials, and floor tiles in all of the popular styles and textures. Thresholds can be made of wood, plastic, composite material, or natural stone. The latter is generally considered to be the preferred material because of its non-porous nature and the fact that stone requires very little maintenance. These advantages more than outweigh the slightly higher cost of purchase and installation. Besides, marble is now more affordable than ever before, especially when it is purchased through a wholesale distributor. 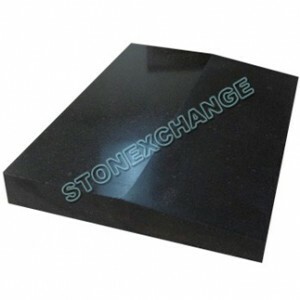 At Stonexchange, we offer the highest quality material at well below retail prices. The following is a more thorough examination of the five major advantages of using marble as a threshold material. Building plans often call for the use of natural stone as a material for floor tiles, walls, shower stalls, countertops, and window sills. 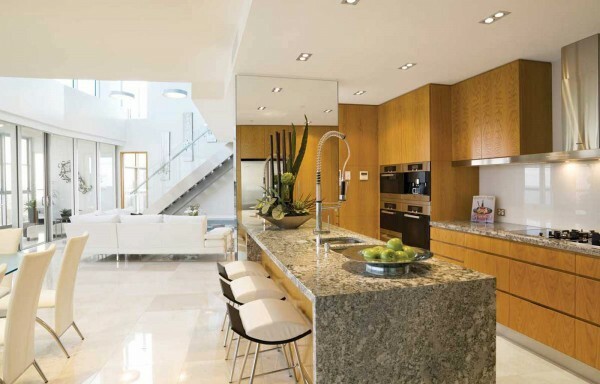 A home decorated with natural stone takes on a majestic look, one that speaks volumes about the taste and style enjoyed by the property owner. However, decorating a home or office interior is a very advanced art, one that involves complementing colors, shades, and textures in a positive manner. If a room is finished with marble floor tiles and marble window sills, using the same material as a surface barrier enhances the appearance of the entire area. It is therefore important to match the shade of the threshold to the style and texture of the marble used in the flooring tiles and window sills. At Stonexchange, we carry a huge selection of crema, nuevo white, and black stone material for use as sills, curbs, saddles, and floor tiles. When these products are ordered in bulk, finding color matches for a particular room of the property becomes quite easy. The threshold will nicely match the other marble used in the surrounding area and act as a highlight accent that is sure to please the property owner. Unlike wood, marble will not absorb moisture. This makes it the perfect material for use as a water barrier. In and around the bathroom, junctions between tile and carpet are often covered by marble strip thresholds as a means to hold back any standing water. Wood often soaks up moisture from the highly humidified air in the bathroom. Eventually, bloating, cracking, or rotting occurs. Marble is non-porous and will not be affected by high humidity. It also acts as a tight seal to prevent moisture from seeping through to the underlying substrate material. Marble thresholds can be cut into perfectly beveled shapes that will not split or crack, even after 100 years. It can be finely polished or honed to give it the perfect appearance, one that lasts forever without fading. Threshold material can even be used as a bathroom curb or baseboard around a shower stall. It blends well with a variety of floor tile textures and is very easy to install. Our company offers wholesale prices on bulk orders of 50-100 pieces of top-quality natural stone thresholds. Each piece has been cut to exacting standards, and we even offer our customers excellent prices on custom lengths and widths. These special orders are manufactured overseas near the quarrying operations and sent directly to our Florida warehouse. Once installed, marble can pretty much be left alone. Because it is impervious to water penetration, marble does not need to be sealed or be coated with a layer of shellac. Nor does it need to be polished over and over again. Marble is a very hard rock, one that has been compressed over millions of years. It is also very easy to cut and shape, making it a prized building material. The wonderful striations, mottling, or veining patterns seen in marble are the result of different compounds being compressed together over millennia, forming a stone that is very difficult to scratch, chip, or cut. 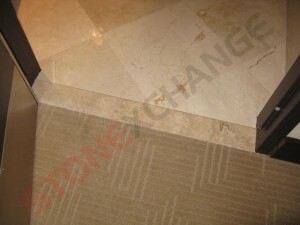 Once in place, a marble threshold remains sealed to the substrate and will not bow, crack, or expand. It will not contract in low temperature. All the property owner need do is give it an occasional wipe with a hand cloth. Another advantage of using natural marble stone as a floor threshold is its wonderful ability to hold back water while at the same time making for easy access by pedestrians. The single-bevel and double-bevel styles of thresholds distributed by our company are available in standard 5/8-inch thickness. When set properly on the underlying substrate material, these thresholds act as an efficient barrier against water seepage and will not protrude upwards in such a way as to prevent normal foot traffic. Thresholds are normally set below the level of the adjacent floor material. Only the beveled portion of the stone is raised above the level of the tile, carpet, or hardwood. This makes it easy for foot traffic to pass safely, and wheelchairs can also pass over the marble strip with ease. Both our single- and double-bevel thresholds have 1/4-inch slopes that are ever so slightly rounded. Our Hollywood style beveled thresholds have longer, more gently sloped angles and are also 5/8-inch in thickness. All of our styles are expertly cut and shaped at our manufacturing headquarters overseas. Marble has always been valued because of its lasting quality. The investment made by the property owner in the purchase of natural stone thresholds, sills, tiles, and countertops is rewarded by higher resale value of the property. For one thing, anyone who walks into a room decorated with marble flooring, sills, and thresholds is at once impressed with the overall appearance. Also, homes and business properties are appraised at a higher value when they contain marble as a building material. This is because the product itself is valuable and is seen by prospective buyers as insurance against costly maintenance and repair. At StonExchange, we stock all of the popular shades and sizes of marble thresholds. Our inventory contains Nuevo White, Crema Sahara Marfil, and other shades that will match builder instructions. In every part of the country, building and design trends show tendencies toward a certain style and color of marble, and our company maintains an inventory of each type of material favored by builders and architects. It therefore becomes easier for the construction company or building designer to complete a home or office interior with the perfect style of marble product to maximize the property’s value. Those in the remodeling industry also have the advantage when trying to increase the value of a home or commercial property. These companies can order bulk product from Stonexchange and save a tremendous amount of money while at the same time upgrading the value of a property. Our Florida-based company imports full crates of marble thresholds directly from quarrying operations located overseas. We partner directly with manufacturing facilities located near the quarries and do not employ outside help to shape and polish our marble products. We can offer our thresholds, sills, and tiles at a significantly lower cost to retail outlets, construction companies, and home improvement centers. We ship full crates to all corners of the continental United States. We have a minimum piece count ordering process, but our commercial customers benefit from this operation because they will always be assured a full inventory of the most in-demand product at all times, even in the winter months when construction and remodeling activity is lowest. Any company wanting to save money on top-quality natural stone thresholds is encouraged to contact our sales representatives for complete information on pricing, shipping schedules, and custom orders of non-standard size material. We are confident that our direct import and distribution will appeal to all commercial customers wanting to obtain marble thresholds at affordable prices. Feel free to contact us with questions on order sizes, setting up a recurring order schedule, or delivery information. Our success is based on customer satisfaction, and we aim to delivery only the finest marble products at a price that competitors cannot beat.